Happy December everyone! News from around Westport is Crabbing in the bay is open and a few folks who would brave the cold have been picking up a limit or two of nice Crab! Rockfish are available too to those who fish the jetty and venture out to the nearby by rock piles. Remember No retention of Ling Cod this time of year is allowed. Ling Cod season begin March 12 2016 in MA2. This Saturday December 5th is the annual arrival of Santa in Westport. He will be arriving around 10:30am on Float 6 via USCG water sleigh. Along with Santa’s arrival in Westport, most local merchants will be open for the first annual Shop the Docks. This is a Great way to enjoy the coast and support these local communities during the off season. We will be open and will offer a special discount to Salmon University readers! On the Clam Digging front this is still the latest info we have. Fingers crossed for decent conditions for the derbies. Here San Juan Propane’s tanker and barge make a run across Rosario Strait in recent heavy weather. 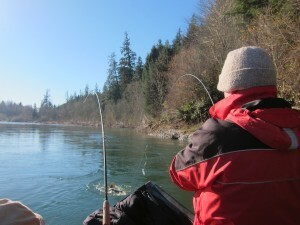 Winter Chinook season opens December 1st in Marine Area 7. Two derbies will kick off the festivities on December 4th and 5th: The Resurrection Derby in Anacortes, and the Friday Harbor Salmon Classic on San Juan Island. It looks like both tournaments may be sold out. Good luck and be safe to all participants. See you on the water! The salmon fishing remains very slow with very little salmon fishing pressure because of the slow fishing, hopefully it will pick up this month. The usual spots to fish are the Les Davis fishing pier area although the removal of the artificial reef there could have a negative impact, Slag area, and Clay Bank area, and the shelf area between Pt. Defiance and Pt. Dalco on the outgoing tide, trolling flasher and artificial squid or spoons and cover a lot of area at depths of 120’ to 150’. The crabbing remains a little slow with catches ranging from 1 to 3 Dungeness crab after soaking the pots for a long time. The Squid fishermen are still doing well but not as good as a couple of weeks ago around the area’s public fishing piers, the fishermen fishing from their boats are doing a little better. Kevin and I with a “Double” that we landed on the Black Friday! Kevin and I went with Todd Girtz of Todd’s Extreme Fishing. Our hope was to catch some Coho and if time permitted try for some early run Steelhead. I met Todd through the Puget Sound Anglers, where we are both members of several Chapters. We chose to go with Todd because he is extremely knowledgeable and generously shares his knowledge with other anglers. We launched at Highway 101 at “zero dark thirty” and proceeded down river until we reached the first hole that we were going to fish. We set up and waited for daylight to begin fishing. We started primarily fishing eggs under a sliding float. It was extremely cold with the air temperature in mid-20’s. The fish did not seem very active because the action was initially “stone cold”. However, we stayed warm thanks to a propane heater that Todd has in his boat. Staying warm was important because that kept us actively fishing. During this time, we saw most other anglers crowded around fires trying to get warmed up. You are not likely to catch many salmon standing by the fire! As the morning progressed, we moved down river, fishing as we went but we had no “hook-ups”. During that time, the sun rose into the crystal clear sky and the temperature climbed quickly. I believe the sun was our ally that day because as the temperature rose, the “bite turned on”. And at times, the “bite” was extremely “hot”. In short order, we landed one double and also hooked numerous fish on successive casts! Fishing does not get any better than that! We were catching a mix of “clipped” and “unclipped” Coho plus Kings. The fish were very large and great fighters! The biggest Coho approached 19 pounds while the biggest King was almost 30 pounds! Some of the Coho were dark but others were very bright. Also, all the Kings were very bright, but they, like the “unclipped” Coho, they had to be released. I believe our success was due to Todd’s knowledge of both the river and the fish themselves. Some of the places we fished were obvious spots but others were areas that most other anglers overlooked. Also, he uses a very wide selection of techniques to achieve success. I already mentioned that we used eggs fished under a sliding float but we also used spinners, jigs and bait divers with eggs. They all proved effective when fished in the right spot. After the “Hot Bite” ended, we floated down stream fishing many more spots until dark. Some spots held biting fish while others did not. The scenery was especially gorgeous due to the very clear sky! Plus, we saw lots of wildlife including lots of eagles, with as many as 4 in one tree! The author with a very tasty Coho! We did not catch any Steelhead but this is because we chose not to target them. 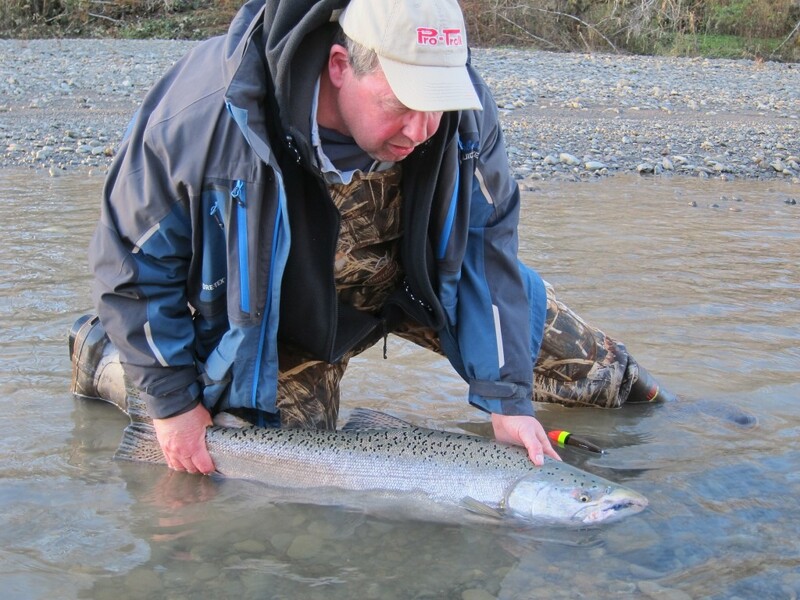 However, we talked to several anglers who caught one a piece, so the Steelhead are starting to show up now. The river is low right now but has great visibility. However, it is starting to rise due to the rain they are getting in the area now. Plus, the weather forecast is for more rain this week and that will bring in some more fresh Salmon and Steelhead! Another piece of useful information for the first-time oarsman going down the “Hump” is that there is a “Boat Chute” just above Stevens Creek. At this location there is a small diversion dam that channels water into the hatchery intake (which is referred to locally as the “The Rack”). On the right side of the dam there is a “Boat Chute” with a sign overhead. In the daylight it is obvious but in the dark it is helpful to know about it in advance. The “Boat Chute” is a good reason to float the river first with someone who knows it well. Failing that, at least follow a knowledgeable oarsman down river because the recent flooding has significantly changed the lower portion of this float. We had a great day on the river with Todd and learned a great deal. 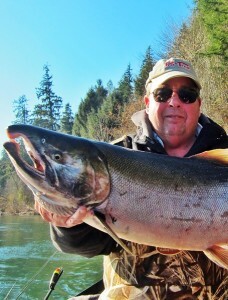 If you would like to fish Todd, give him a call at (253) 208-9142 or www.toddsextremefishing.com. It looks like December is white month. Most everything has a thin covering of snow and more is forecast for tonight. All of the smaller lakes have a thin covering of ice, but very thin. We have not had temperatures in the 30s for several days and usually starting in the low 20s. The main Potholes is free of ice but pockets like Linn Coulee are showing thin ice like up in the dunes. Some of the larger lakes below the dam have iced up but the larger lakes like the Windmill, Canal lakes are still open. There was not a boat trailer at the Linn Coulees or at the launch on the east end of the dam yesterday. There were just a few guide boats that had launched yesterday. Remember that the launches will ice up from water dripping off the trailer of a boat launched. Carry sand of deicer if you plan to launch. It seems like most all ducks have left the area. Shore fishing for trout has been good at Medicare Beach and lakes such as windmill and canal lakes. Also sage lakes were reported still clear of ice. Last year there was not enough ice for safe ice fishing and to this point this remains the same. That can change in a few days if temperatures decide to really drop. Salmon fishing was FAIR for anglers in East Sooke. There were more winter springs caught but most are not too big. G-force spoons were the most productive lure. However, plastic baits have been popular as well, especially in UV and/or glow patterns. The Glow/Green Stripe hootchy has been effective for springs this past week. Spoons, such as the G-Force and Skinny G, in the Bon Chovy or Irish Cream colours were effective. For flashers, the Lemon Lime and the Purple Onion have been good. Four halibut were brought into the marina on the weekend. Salmon fishing was PICKING UP this past week. Some winter springs have been caught and they were too small for retention. Most salmon were caught when fishing with lures right on the bottom (60-110 ft) on the Flats and by the Gap. The fish were hitting needlefish spoon and squirts. G-force and Skinny G spoons in No Bananas and Outfitter colours worked just fine. Coho Killers in Gold Nugget and Green Splatterback have been pretty productive too. The best flasher has been the Gibbs Lemon Lime and the Bon Chovy. Salmon fishing was VERY GOOD this past weekend. Most of the action was inside the bay and even though not many anglers were out fishing, winter springs of 20, 12,12, 10.5, 10, 8.5 and 8 lbs were seen at the marina’s cleaning station. The 20 lb spring was caught at 80 feet in 90 feet of water near the kelp beds. The rest of the fish were caught close to the bottom. The anglers arec fishing tight to the bottom are often bouncing the downrigger balls on the bottom. There are a lot of shaker chinooks all around this area. Small spoons, such as the G-Force, Coyote and Gypsy, in the glow and/or any bright colours were very effective. Hootchies and squirts also produced well. Flashers that remain popular include Glow green, Lemon-Lime and Purple Onion. Halibut fishing was GOOD this past week. Anglers that were fishing were using extra large herring, salmon bellies and/or octopus for bait. Berkley Gulp and Powerbait soft plastics also work very well. You can also use a large spoon fished off a spreader bar, Mudraker or Lucky Jigs or other large Jigs if you want to stay away from the dogfish. Salmon fishing was SLOW near Sidney. There is a lot of bait around Coal Island and Sidney Spit, so there should be some fish there. Most of the winter springs are short of the minimum size for retention. Most anglers are fishing using anchovies in Bloody Nose and UV Green teaser heads. Coho Killer spoons have also been working well, especially in double glow and Gold Nugget. Prawning has been quite slow in Saanich Inlet as well. The salmon fishing was PICKING UP this past week. There are lots of undersize springs off Sooke right now and few keepers into the mid teens. The 3”-4” Coyote, Gypsy and G-Force spoons, as well as hoochies, are the top choices for Sooke anglers. G-Force spoons in Outfitters, Irish Cream and No Bananas have been very popular. Hoochies in White Glow, Army Truck and Tiger Prawn have been catching their fair number of fish. The most popular flashers recently have been the Ok’i Betsey, the Gibbs Outfitter and the Madi. Fishing for salmon was GOOD off Victoria. More than one 10+ lb spring was caught along the waterfront and there were lots of smaller fish too. Mike Weber got a nice pair with 10.5 and 8.5 springs from near the harbour entrance. There were a lot of salmon on Constance Bank too. Anchovies, spoons and squirts were successful in getting hook ups. Chartreuse and Purple Haze have been the most popular colors for teaser heads. Good choices in plastic baits are the Electric Chair, Purple Haze and Glow white. Gypsy, AP Needlefish, G Force and Coyote spoons in green, moon glow and silver colours have also been good. The Purple Onion and Bon Chovy flashers have been popular recently. Halibut remains VERY GOOD with lots of big herring still around between Middle Bank and Constance Bank. Good depths seem to be between 155 ft and 255ft for active fish and herring with salmon bellies and octopus working best. A 68.3 lb (132.5 cm) halibut was weighed in at the store and takes over 4th place on our leader board. Most anglers that were fishing were using extra large herring, salmon bellies and/or octopus for bait. Berkley Gulp and Powerbait soft plastics also work very well. You can also use a large spoon fished off a spreader bar, Mudraker or Lucky Jigs or other large Jigs if you want to stay away from the dogfish. 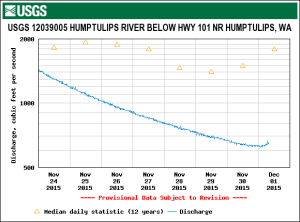 No rain and cold weather has allowed the river levels to drop steadily all week. The water level at the lake is over 1.3 meters and it’s over 1.15 meters near Duncan. Chum fishing in the lower river has been slowing down. There are some coho in the river but it is strictly catch and release. At the top end, egg patterns are the flies to use now when targeting trout. Effective until December 31, 2015 the daily limit for chum salmon is two (2) adults in the following portion of the Cowichan River: Downstream from the Mile 66 Trestle Bridge to the Highway No. 1 Bridge (Silver Bridge). Anglers are reminded that coho retention (both adults and jacks) remains closed at this time. The Cowichan River is Open to Fly Fishing Only from the Weir in Cowichan Lake downstream to the Mile 66 Trestle (CNR Trestle).